As a British nerd growing up in the ‘80s, my education in fantasy went from Harryhausen movies aired during the school holidays, to Fighting Fantasy gamebooks, to Games Workshop wargames and miniatures. The grimdark worlds of Warhammer remain milestones in my imaginative development and one of the great - and distinctively British - contributions to the fantasy genre. I was recommended to the publishing team by fellow writer George Mann in 2015, and was soon commissioned to write a short Space Wolves vs. Dark Eldar tale, which became Stormseeker. The story had to centre around aerial combat, which was tricky to write as the excitement of ship-to-ship battles is tough to convey on the page - since the action has to be described from the point of view of someone essentially sat in a chair and staring out of a window! All these prose stories are written to tight deadlines and require detailed knowledge of the source-lore before you can even pitch an idea. Fortunately, I get plenty of support from Black Library’s brilliant editorial team, including Nick Kyme, Hannah Hughes and Lindsey Priestley. My stories have been well received so far with plenty more tales in development. My latest project is an audio drama (my first step into that medium). I’ll post more information as and when these are officially announced. Superstitious Iron Priest Anvarr Rustmane takes to the air in defence of his Space Wolf brothers, but has he met his match in a pair of vicious Dark Eldar pirates? 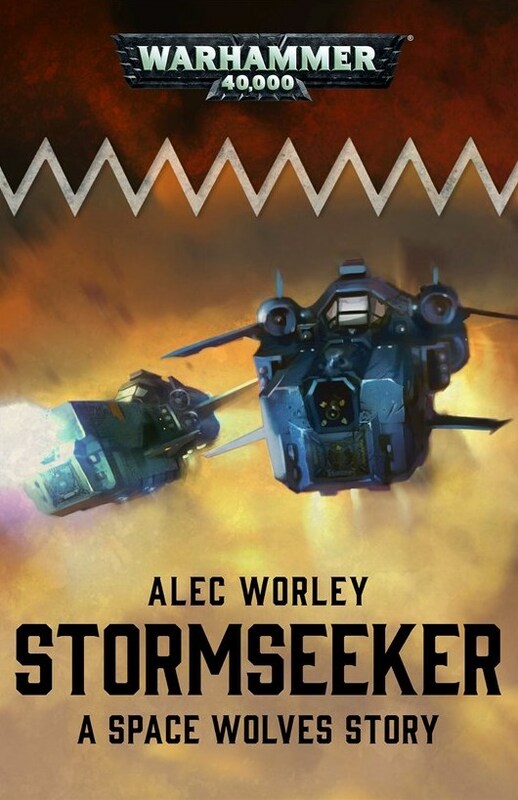 Stormseeker is available as an ebook from the Black Library webstore, from iTunes, and from Amazon UK and Amazon US. It's the Purity Cup final, and the purest team in the league, the Bright Crusaders, are losing to a pack of low-down, cheating rats? Can the team convince their self-sabotaging star player Gerhardt the Penitent that winning is more important than fair play? ​Pride and Penitence is available as an ebook from the Black Library webstore, from iTunes, from Amazon UK and Amazon US. This story is also due to be collected in Death on the Pitch: A Blood Bowl Anthology (due for publication December 2018), available for pre-order on Amazon UK and Amazon US. Venturing into an ancient ruined city alongside the grim Sisters of Battle, Imperial Missionary Marcus Amouris discovers that the Emperor works in mysterious ways… as do other, darker powers. ​Whispers is available as an ebook from the Black Library webstore, from iTunes, from Amazon UK and Amazon US. "Hugely entertaining... Characterful, beautifully paced..."